Byakuran is the former head of Gesso Famiglia and one of the two current bosses of Millefiore Famiglia, the other being Uni. He is the head of White Spell of Milefiore and commander of Funeral Wreaths and many other strong individuals. 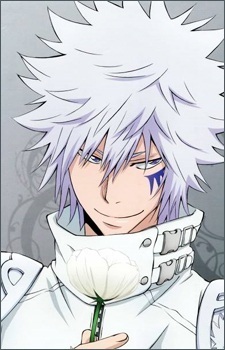 Byakuran has spiky white hair and light purple eyes. His distinguishing feature is a purple tattoo under his left eye. In his first appearance, he wears the standard White Spell uniform with a Mare Ring symbol on the side of his shirt and has silver shoulder pads with the Millefiore insignia like the other members.